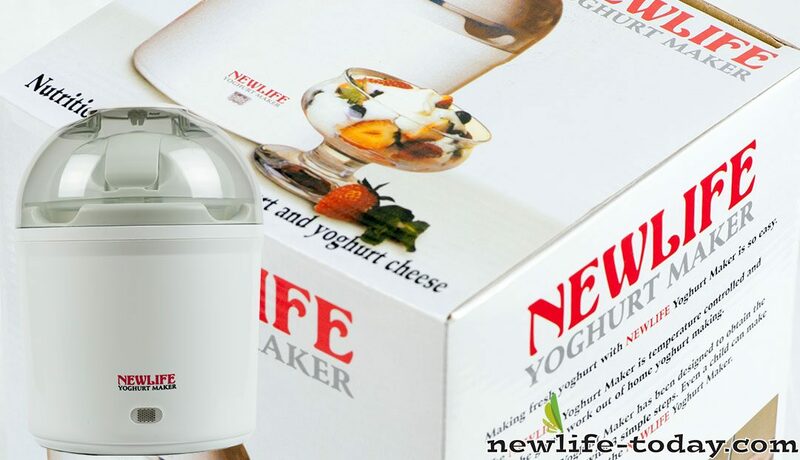 Buy this Yoghurt Maker at RM 129.00 (20% off retail) when you become a member of NewLife International. The NewLife Yoghurt Maker allows you to make your own nutritious homemade yoghurt with Newlife Yoghurt Starter and Organic Cows Milk. Simply start with your choice of milk to make natural and healthy yoghurt which can be flavoured and eaten on its own or used in different recipes such as yoghurt drinks, low-fat yoghurt salad dressings, delicious salad dips, and acts as an excellent topping for fruits. The Newlife Yoghurt Maker allows you to make more than yoghurt. You can also make a tasty, soft low-fat cheese. (Recipes are included in the Recipe Book enclosed). Making fresh yoghurt with Newlife Yoghurt Maker is so easy. The Newlife Yoghurt Maker is temperature controlled and takes the guess work out of home yoghurt making. The Newlife Yoghurt Maker has been designed to obtain the best possible result with 3 simple steps. Even a child can make fresh yoghurt now with the Newlife Yoghurt Maker. Plug in the Newlife Yoghurt Maker. Mix all the ingredients (milk, water and yoghurt culture) in a bowl. Pour content into the yoghurt pot. Put Yoghurt pot into the Newlife Yoghurt Maker. Yoghurt is a form of lactic acid or fermented milk. It can be prepared from cow’s milk, goat’s milk or soya milk, with yoghurt starter which contains friendly bacteria (L. Bulgaricus, S. Thermophilus, L. Acidophilus). Yoghurt has been used since Biblical times as a food and to eradicate intestinal putrefaction and autointoxication. Yoghurt Maker features precise automatic temperature control throughout the fermentation process, ensuring quality yoghurt every time. Rich in predigested protein and easily assimilated calcium and other minerals. Beneficial in relieving constipation. Clears up symptoms of colitis and bowel diseases, fights urinary tract infection, bladder infection, anemia, hormonal inbalance and skin problems. Aids the body in the manufacturing of the B Vitamins. Resolves bad breath, gas and indigestion. If yoghurt should cause temporary intestinal gas, it is an indication that the body’s need for it is great. The beneficial bacteria of yoghurt is waging war with the health – destroying bacteria ready residing there. Discomforts disappear when the beneficial bacteria multiply sufficiently. Restores the intestinal floral (friendly bacteria) destroyed by antibiotic therapy and meat eating. Effective in controlling antibiotic-induced gastrointestinal symptoms, e.g. diarrhoea. An eight oz jar of yoghurt has an antibiotic value equivalent to fourteen penicillin units. The most potent yoghurt for antibiotic factors is that which is 7 days old. Helpful in cases of Candida and vaginal yeast infection. Yoghurt reduces cholesterol and thus risk for heart disease. Prevents cancer cells from growing. Prevents Estrogen levels in women. Prevents osteoporosis and dental disease. Prevents “Tourista” – diarrhoea experienced by travellers as a result of foreign bacteria in the food and water. (i) 1 cup of hot distilled water and 3 cups distilled water at room temperature. (ii) 12 large heaped tablespoons milk powder. Sieve into the Yoghurt Maker container. Transfer out 2 tablespoons of the liquid milk into a glass. Put in a packet of Yoghurt culture. Stir until dissolved. Pour into the Yoghurt Maker container. Stir. Cover and turn on the Yoghurt Maker. Yoghurt should be ready in 6 hours. lf fresh yoghurt is used as culture, the incubation period is 2 1/2 – 3 1/2 hours Yoghurt starter should be used as often as possible to ensure the good bacteria count (maximum of twenty reculture), otherwise you may miss the beneficial effect of yoghurt. Note: Yoghurt Is best taken with 1-2 tablespoons of Flaxseed Oil for optimal benefits.